Such a perfect house for youir style and your furniture! It looks welcoming already. Thank you for sharing this process. I know it takes a lot of your time...time you don't have right now riding your crazy train. Your mommy loves you lots. 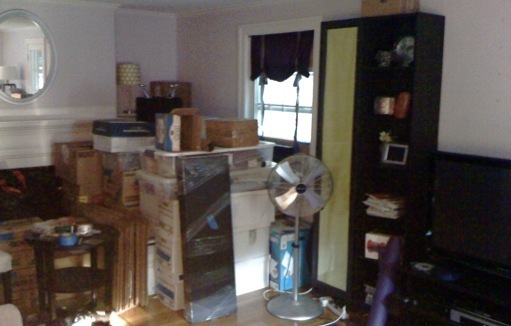 Moving Day went off without a hitch on Wednesday, August 25th (it’s a week and a half later that I write this). The biggest issue was the rain that had been falling for about 4 straight days by this point. But, all in all, we made it here, and were very happy with the movers. The next morning, we had a visit from an energy auditor. We are looking into making a bunch of improvements, and he came to tell us about various loan programs and rebates that are available. The best part was he gave us new efficient compact fluorescent light bulbs, a new low flow shower head, and two programmable thermostats. All of which he installed...for free. Pretty cool. One of the big projects we plan to take on soon is improving the energy efficiency of our house. We are looking into getting a state sponsored energy loan which will hopefully help with the replacement of all the windows, converting the oil boiler to gas, and possibly adding some insulation to the roof. 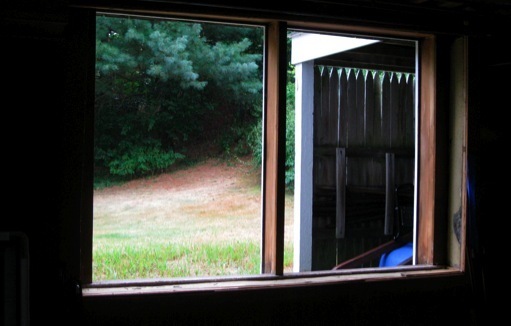 It will take some time to go through that process, so we elected to replace three windows before we officially move in...the basement (old windows shown above), the kitchen and the laundry room. These windows avoided any need for contractors to walk on our newly re-finished floors, and we won’t have to move the washer and drier out of the way later on. Most importantly, we we finally get around to the rest of the windows, we know we have one room where we can safely confine the cats while there will be big gaping holes in our walls...like this one in the basement below. 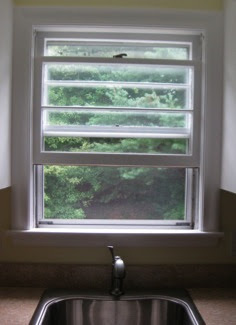 Here’s a before shot of the kitchen window. 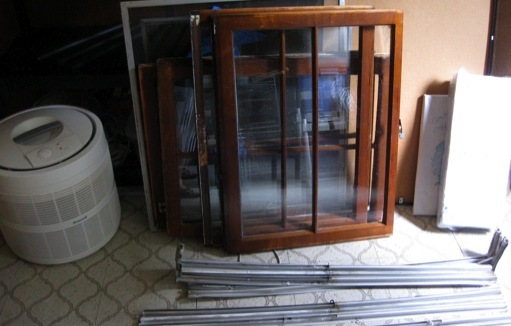 We are replacing it with a casement for a larger uninterrupted view of the back yard, and we think it will be easier to crank the window open instead of leaning over the sink to close a double-hung. I left the house today before the windows were finished, so stay tuned for the final results. New windows make an amazing difference in life! I like the approach of some now, some later as well... smarty pants! Pre-move weekend began on Thursday with the arrival of my mom to assist with packing. By the time I got home from work, she already had the dining room well under way. Friday, she was joined by Gina where the packing in the dining room and kitchen continued. Bright and early on Saturday morning, Greg’s merry band of movers started to arrive. Above, Eric, Jeff, George and Greg are taking a breather while waiting for our pizza lunch to arrive. The yellow van in the background belongs to our next-door neighbor, but below is a look at the six vehicle involved in the moving caravan. Steve and Doug were also involved. It’s been an incredible long weekend. And even though I keep freaking out, I am incredibly grateful for all the help we have had from friends and family, especially since my mind and time has been occupied by my upcoming exam. Definitely be grateful... I'm so all set with packing and I haven't even started! Greg made four trips to the house yesterday...after driving two hours back from out vacation. I helped unload one. He did one by himself, and two with the help of our friend Steve. He is indeed a moving machine. This is what the bulk of those loads look like in the temporary storage area we’ve set up in the corner of the basement. And below, is tonight’s load waiting to be taken out of the truck. Go Greg! Go Greg! Go, Go, Go Greg!!! Such organization. Such a fantastic garage. Take care of that moving machine. We stopped in to look at the floors today after getting back from our vacation on the Vineyard. They are sopping wet with polyurethane here, but looking amazing. So much cleaner and lighter. I am very happy with the color. Can’t wait to be able to walk through the house and see the rest of them. See below for where they started. 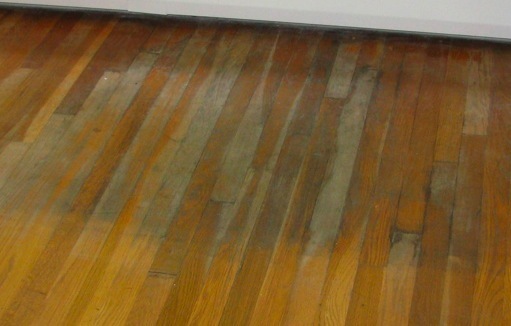 Bright and early, at 8:00am this morning, the flooring guys showed up to start sanding. They will be refinishing all the wood floors while we are relaxing on the vineyard. We were really concerned about one particular spot by the living room window, which they were able to sand while we were still there. It looks like it’s going to clean up just fine. We can’t wait to see the finished result when we gat back! They are going to be beautiful floors! Our first day with the new house was quite busy. We brought over some basics like toilet paper, paper towels, trash bags, bottled water and some folding chairs. We didn’t want to bring too much just yet, because we are having the floors refinished while we escape to the vineyard for a few days. We did manage to vacuum and mop the basement, and Greg tore down the soffit in front of the basement window to prepare for the new window installation. And, we did bring over our air mattress so we could have what Greg refers to as the “ceremonial” first night in our new house. Since my mom keeps asking for more photos, especially of the pink bathroom, here’s a link to an album of pictures I took after waking up for the first time at Kingston Road. (please note, I need to redo this album online somewhere). Thank you for the photos. I will keep going back to them, but here are a few of my thoughts. You will be able enjoy 5 Kingston from the moment you move in. It is a blank canvas that you two can fill with creativity and love. Pretty color: blue with a red door. Mature trees in the front and back – gorgeous; mature bushes. We closed on the house today!! Despite a few small math errors on the part of our lender, it all went off without a hitch. We were at our new home by 10:30, and were greeted by a traditional Jewish housewarming gift of bread & salt from Greg’s Uncle George waiting between the front and screen doors. A few minutes later, we found our friend Michael on the front steps trying to surprise us with some balloon. I guess our closing really did go pretty quickly. He wasn’t expecting to find us at the house already, but lucky for him, he was able to get the tour. 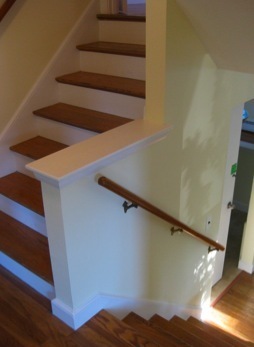 By special request, here are a few pictures of the stairs, which are an essential feature in a split-level house. The shot above is taken from the landing outside the back bedroom door, looking up at the stairs to the master bedroom, and down to the living room. You can just catch a glimpse of the fireplace and the living room window. Here’s a view from the landing in the in the other direction. At the bottom of the stairs, you can see the doorway to the kitchen, with the open door to the garage level blocking the opening. 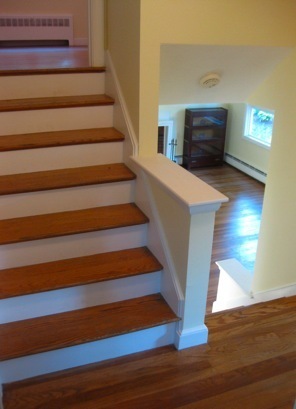 The last shot shows the base of the stairs from the living room up to the landing. I like how the stairway adds to the open feeling of the house, and makes the living area feel connected to the next level, especially because we will be using one of the bedrooms as an office. I also think that the cats are going to enjoy these stairs a lot, especially the little ledges on which they can perch. In other news, our incompetent mortgage broker just informed us that we need to increase our insurance policy...less than 24 hours before we are supposed to close (after they already gave us a clearance to close), and while we were waiting for a final number so we can go get a cashier’s check to bring to the closing tomorrow. Now, we have to go back to our insurance company to pay more money, get proof of that, and go through the whole process, hopefully getting the final number from the bank’s attorney in time to get our cashier’s check tonight before the bank closes. Why can nothing ever be easy??? These are really lovely stairs! Now I have a better idea of the flow of your home. 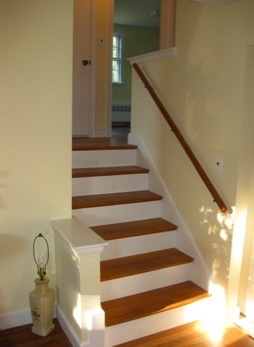 The stairways will be fun for you to decorate/design. I so hope that the insurance is the last bit of fixing you have to do before the closing! If it makes you feel any better, we found out there was a snafu with our bank account when I went to go get the cashier's check and couldn't get it issued. UGH! First, let me say, we are officially cleared to close on the house, and that happens in only two days! It’s very exciting! Now, I thought it might be amusing to talk about our kitchen appliances. Our house was built in 1959, and we are only going to be the second owner/occupiers. You can imagine that the house probably needed a lot of updating. We are grateful that Hans Brings, the real estate king of Waltham, and his team, spent a lot of time refreshing the house to get it market ready. All the carpet (I’m sure there had to be some) was gone, all the walls “yellow-washed,” not a speck of wall paper in sight, new peal and stick floor in the kitchen, new light fixtures in the dining room & kitchen, and...a handful of new appliances...including a new cook top, refrigerator, sink/sprayer faucet, dishwasher (where there probably never was one) and garbage disposal. But the crowning beauty of the kitchen is the original stainless steel wall oven that looks like it has never been used. It does still work, except for the clock! 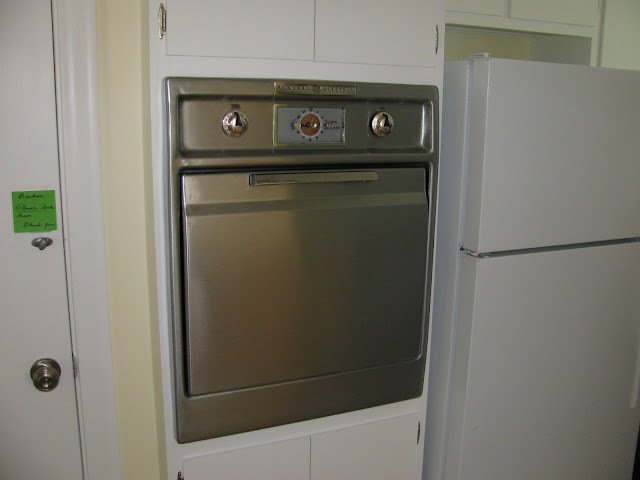 Of course, the beautiful wall oven does pose potential kitchen remodeling issues, as we are told (I have yet to confirm) that modern wall ovens will not fit into the same space. So, if the oven were to go, it could trigger the kitchen redo, which we won’t be ready to take on for a few years yet. In the meantime, we enjoy this tank of an appliance. 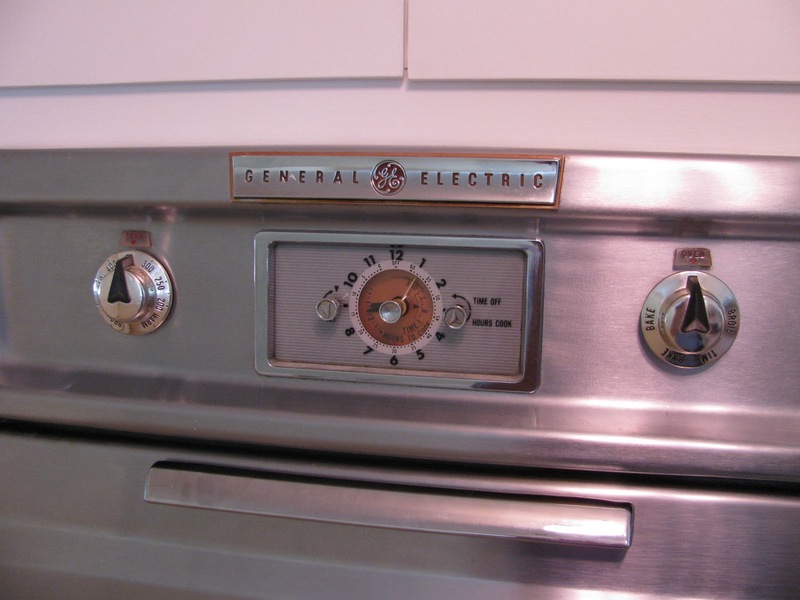 How wonderful to have a "vintage' working oven! People search everywhere for the vintage look. Our new house has a pretty great yard, with a lot of sun and shade. It’s almost a quarter acre in total. 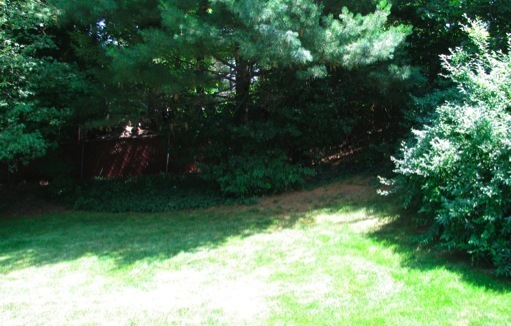 This shot shows about only half of the back yard. We definitely need to get some better pictures. The back yard is almost entirely fenced in. Not enough to keep in a dog, but probably enough to deter some children. You can make out part of the fence through the trees...nothing special, a chain link with reddish privacy strips running through it. We think we own this one, since it matches the small portion of fence with a gate that we have at the north side of the house. Aside from the fence, there will be plenty of room to add a deck off the dining room, and hopefully some day a swimming pool...probably only above ground, but I will take what I can get! Back to the fences (there are at least three different types, including the plain chain link owned by the neighbors to out north, and the plain chain link that separates our yard from Trapelo Road at the south) there is a small strip of wooden privacy fence that separates this small patio from the front yard. There are bunch of slate paver which could use a little evening out, but it’s a nice secluded corner of the yard, where will plan to set up the grill until we have a deck. 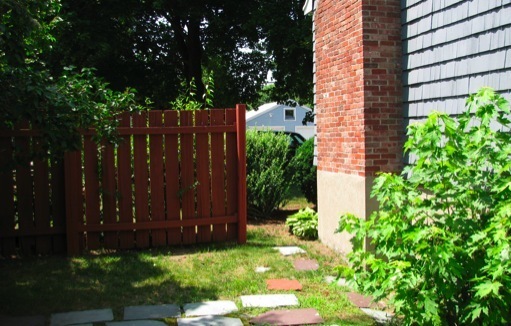 Lastly, this is a view down the front yard, along the other side of that wooden fence. 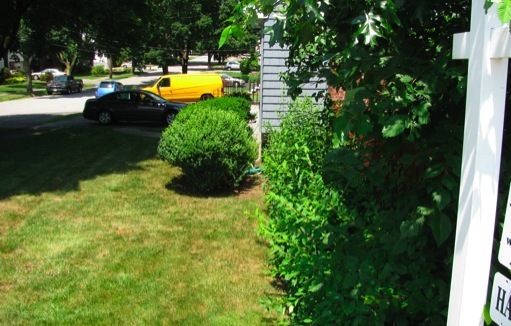 It’s a reasonable bit of yard to have in the front, and has a lovely mature tree, as does most of the street, as you can see in the distance. That looks like a great street ... And yard!!! Ps... My first thought was "what a great trick-or-treat street!" which i find kind of funny since you know how i feel about that holiday! This is a lovely lot. The yard has rooom for everything you want. Good times are comin'! this is going to be a fun project. we are very happy for you . enjoy. As often happens in a household with cats, an empty box makes a good place to escape the chaos. We’re hopeful that the boys will take to our new house as well as they took to this one. Fingers crossed! In any case, there will be lots of boxes to play in for some time to come. As the closing get closer, we are also keeping our fingers crossed that all of the final pieces fall into place. It’s a little nerve wracking, since it’s completely dependent upon lawyers, brokers and bankers, and not all of them are always as responsive as one would hope! But, I’m sure it will all be fine. Eek! This time next week, you'll own a house! Just one week left until closing. Fingers crossed that is all goes smoothly. As you can see, Greg has made a ton progress on packing, and breaking down the living room. What have I been doing? Studying. It’s wonderful timing that I am planning to take my professional exam the first weekend in October. When it rains, it pours I guess. Thankfully, my husband is a super hero. And, we’re not actually moving until later in the month. We’re going on vacation while the floors are being redone first! Nice progress packing. Save some for me.